The Amnesty International USA Archive is a collection of over 3,000 linear feet of material that documents the founding, growth, and activities of the organization from the early 1960s through the present. Managed by volunteer leaders, the collection is part of Columbia University’s Center for Human Rights Documentation and Research. This page has background and contacts about the Archive. In 1994, a dedicated effort was launched to collect, preserve, and make available the history and activities of Amnesty International USA (AIUSA). Today the AIUSA Archive is a collection of over 3,000 linear feet of material that documents the founding, growth, and activities of AIUSA from the early 1960s through the present. The collection is part of Columbia University’s Center for Human Rights Documentation and Research (CHRDR), the official designated repository for the archives of major human rights organizations such as Human Rights Watch, Human Rights First, and the Committee of Concerned Scientists as well as many individual human rights activists. CHRDR enhances the visibility and accessibility of these collections through programming, collaborative projects, and library services. In 2006, Michael Ryan (with the bow tie) was the Director of Rare Books and Manuscripts at Columbia University's Butler Library, NYC. Csaba Szilagyi was the curator for the Center for Human Rights Documentation and Research at Butler Library – Columbia U, and Catherine Carson was an early archivist for CHRDR who concentrated on the AIUSA Archives, Ellen Moore, was the AIUSA staff liaison with Columbia University, overseeing the AIUSA Archives Program. In 1992, Bruce Montgomery, faculty director of the archives at University of Colorado, approached AIUSA's Urgent Action Program staff in Colorado with the idea of beginning a substantial and comprehensive human rights collection; he called it the Human Rights Initiative. The AIUSA board approved the AIUSA Archives Project; board members, local group members and activists, the International Secretariat, and AIUSA staff discussed the benefits of archiving, and collecting materials began in 1994. 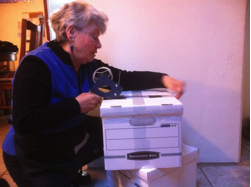 On the strength of the HRI containing the AIUSA Archives, many small and large human rights NGOs and individuals deposited their materials at HRI at the University of Colorado-Boulder, creating the world's pre-eminent human rights archives. Human Rights Watch joined the HRI early in 1999. 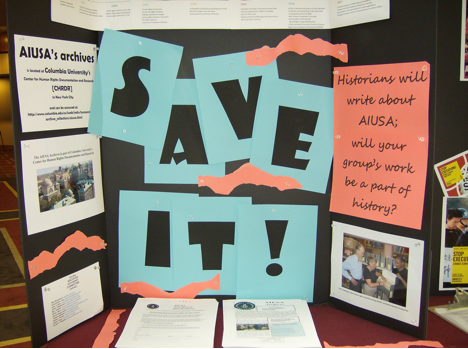 AIUSA Archives display at the regional conferences and Annual General/Human Rights Meetings. Attendees are encouraged to help preserve the AIUSA legacy by depositing all and every human rights letter, press release, government reply, and newsclip at CHRDR. After an AAAC meeting in 1999 at CU-B, the AAAC learned that University of Colorado officials had determined that the HRI no longer fit within the University's priorities or resources and therefore would have to be relocated to a new institutional home. As a result, the major affiliated organizations of the HRI began searching for a new university which would serve to fulfill the original vision and mission of Human Rights Initiative to establish an international documentation center to preserve and make digitally accessible the global legacy of the human rights movement in the United States. Columbia University was selected after extensive communication with over a dozen possible institutions. 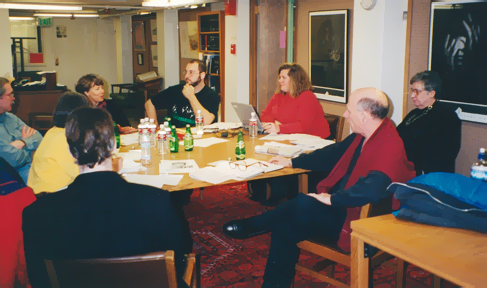 Bill Harris, Thelma Beoder (hidden), HRI curator Bruce Montgomery, staff liaison Ellen Moore, former AIUSA board member Abe Bonowitz, oral history consultant and CU/HRI staffer Susan Whalen, former board member Dave Stamps, former AIUSA board chair Mary Gray working at Norlin Library, University of Colorado-Boulder, at the 1999 meeting. 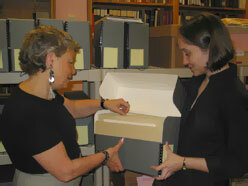 What's in the AIUSA Archives? The AIUSA Archives is comprised of a variety of materials that document the work of the New York headquarters; the Washington, DC lobby office, regional offices, local and student chapters; as well as all programs, committees, and departments of AIUSA. Also documented, is the work of country coordination specialists and members of steering committees and task forces comprised of volunteer leaders and staff members. Correspondence, memoranda, organizational-bylaws, meeting minutes, newsletters, brochures and fliers, reports, photographs, audio/visual materials, oral histories, and memorabilia make up the bulk of the Archives. How may I donate AIUSA material? All individuals who wish to submit material should call or email Carolyn Smith, archivist at Rare Book and Manuscripts, Butler Library, Columbia University. You will be provided with the instructions and paperwork necessary to add your material to the AIUSA Archive. Material received without first contacting the Curator will be returned. Use stout banker boxes with covers and wide clear packing tape to ship your archiveable materials, and include a completed Records Transfer Form in each carton. At the present time the National Office Records are available for research. Material continues to be prepared for public access. Finding aids for all human rights collections may be accessed by keyword search in the Columbia University Libraries Archival Collections Portal. Unless clearly marked as restricted in the finding aid, material is available for public access. Permission to quote or publish materials from the AIUSA Archives must be requested in writing. Please email your request to Ellen V. Moore at [email protected] or call 303-258-9246. Contact CHRDR archivist to describe the materials you hold. Fill in a Records Transfer Form, pack you material in stout banker boxes and mail to the address above, at Columbia University. The AIUSA Archives also contains many written, audio, and video histories of activists. If you'd like your AIUSA experiences and opinions to be a part of the AIUSA Archives, please contact Ellen V. Moore at [email protected]. What to Save for Deposit in the AIUSA Archives. Individual activists, AI groups, and AIUSA board members, volunteer leaders, and staff should seek to retain materials that document their major operations, activities, achievements, and policy decisions. These might include, for example, meeting minutes, organizational by-laws, policy memorandums, documents detailing major decisions, investigative reports and publications, correspondence, development/donor materials, press clippings, promotional materials: brochures, fliers, and case materials, photographs and videotape, posters and t-shirts, documents regarding internal deliberations and debates, interactions and networking with other domestic and international organizations. What is the Center for Human Rights Documentation and Research (CHRDR) at Columbia University's Butler Library? By Spring of 2006, the CHRDR featured Amnesty International USA, Human Rights Watch, Physicians for Human Rights, and Human Rights First as its cornerstone human rights collections, dozens of collections of smaller human rights NGOs, and collections of individuals including their correspondence with governments and human rights defenders, a professional archiving staff, many researchers regularly using AIUSA archived materials to write theses, dissertations, and journal articles, ad hoc meetings of members of AAAC members. The AIUSA Archives Advisory Committee is involved in continuous email conversation, telephone calls with one another, and with Center Director Pamela Graham and Archivist Carolyn Smith. AIUSA routinely requests that researchers and writers using the AIUSA Archives include attribution of the AIUSA Archives and Columbia's CHRDR in their publications, the name of the photographer and date with any photograph, mention of AIUSA and the CHRDR in the credits in the forward or acknowledgements’ section, and that a copy of the article or book be sent to Columbia’s CHRDR to become part of the AIUSA Archives.